Terrorist opened car door, attempted to stab Israeli passengers - but was shot dead by armed driver. 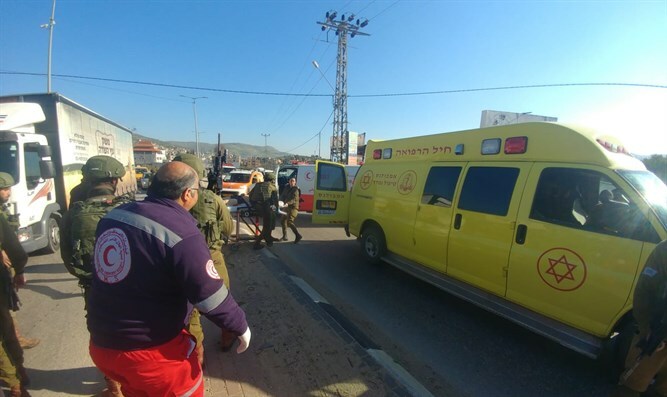 A terrorist was shot and killed in Samaria Wednesday morning, during an attempted stabbing attack near the Hawara checkpoint south of Shechem (Nablus), an IDF spokesperson said. The incident occurred at approximately 8:30 a.m. Wednesday, when a Palestinian Arab terrorist carrying a knife opened the door of a private Israeli vehicle as it passed near the Arab town of Hawara on Route 60. The terrorist attempted to stab an Israeli civilian sitting in the front passenger seat of the car, but was shot and neutralized by the driver of the car, a resident of the Israeli town of Elon Moreh, near Shechem. Witnesses say the Israeli targeted by the terrorist was a female ulpana [religious girls’ high school] pupil being driven to school by her father. The terrorist was shot and seriously wounded. Emergency response teams treated the terrorist on the scene and evacuated him to a hospital for further treatment. The assailant was declared dead shortly after his arrival at the hospital. No injuries were reported among Israeli civilians or security personnel. The driver, who has been identified as Yehoshua Sherman, is a member of the Elon Moreh rapid response team, TPS reported, and works as an activist on behalf of the Union of Right-Wing Parties (URP) Knesset list. Samaria Regional Council chief Yossi Dagan lauded Sherman for successfully neutralizing the terrorist and foiling the attack. The stabbing attempt occurred near the Arab town of Hawara, which sits on Route 60, the primary north-south road in Judea and Samaria. For years, residents of the Israeli Gav Hahar (Nablus district) towns in Samaria have complained of regular stone-throwing and even firebomb attacks on Route 60 in Hawara. In 2017, a mob of Hawara residents blocked the road, trapping an Israeli motorist inside the village. A lynch mob attacked the car, attempting to force out the driver, who opened fire, killing one terrorist and wounding a second.